Have you noticed how life in India can be so chaotic. Forget about getting problems sorted out in an orderly and calm fashion. Everyone thinks that the more you shout, the louder you are the problem will vanish. Shouting, loud accusations and chaos does not bring about solutions. However, after a bout of all this ‘hangama’ life carries on till we experience the next round of shouting which gets louder by the second and then suddenly peace and quiet rules. Has the problem been solved? Not at all but for many spectators it is entertainment. But isn’t the chaotic life that attracts so many to India again and again?I am grateful that I’m right now sitting in my apartment where the surroundings are peaceful and quiet and cool breeze cooling my home and typing my post out. It’s Monday and time to present our #FoodieMonday#Bloghop recipe. Our #60th theme is Chatakedaar Chaat. There was much excitement on this theme during the week on chaats. Some knew exactly what they wanted to prepare and some didn’t. I was not sure what I wanted to make till Saturday. 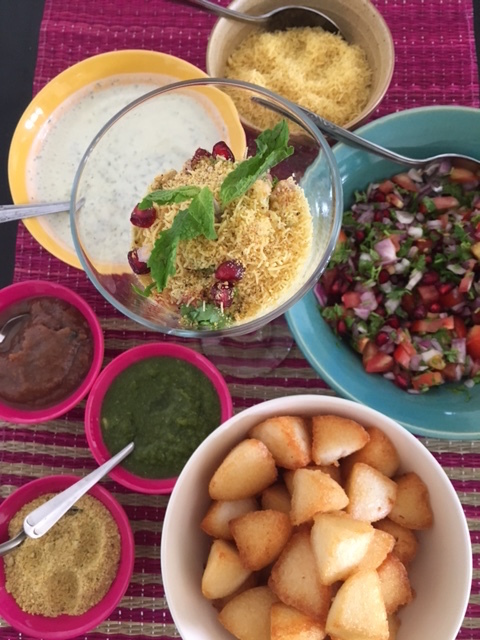 I’ve already blogged a few chaat recipes so it was difficult to choose something else. Friday evening I went to buy an idli steamer and some idli batter to make podi idlis for breakfast on Saturday. My daughter and future son in law woke up late and rushed off to complete some work without having breakfast. Initially was thinking of making sambhar to serve idlis for lunch and then I remembered that during my last visit to Rama Krishna restaurant in Vile Parle(E), Mumbai I had tasted idli chaat. Being in Bangalore right now, I’m in the right place to present a north and south fusion chaat. So the search began for idli chaat and I came across the recipe by the famous Chef Ranveer Brar. He served the idli chaat with flavoured mayonnaise. I’m not a huge fan of mayonnaise and that too in large quantities, a bit is fine in a salad. So getting the basic idea from his recipe, made my version of idli chaat and the end result certainly was chatakedaar(lip smacking tasty). I served 2-3 idlis to each person. It’s also the first time I used ready idli batter and was mighty impressed. By the way all my Kenyan fans, Hare Krishna temples do sell the batter. In UK I know many Sri Lankan shops sell the batter. Making the batter at home is not difficult… its a bit time consuming. Check out my homemade batter here. Cut the idlis into quarters. Heat oil for deep frying in a wok, pan or karai over medium heat. When the oil is hot fry the idli pieces in batches till they are light golden in colour. Keep the fried idli pieces on a kitchen towel(tissue) so that it soaks up the extra oil. Mix chopped tomatoes, onion, coriander and pomegranate seeds in a bowl. Add ¼ tsp salt and mix well. Wash the mint leaves and mince it in a chopper along with the green chilli. Add the mint chilli paste to the yogurt. Add ¼tsp salt and mix till its smooth. To serve, put the fried idli pieces on a plate. Top it with the onion tomato mixture. Add green and date tamarind chutneys. Sprinkle nylon sev over it. Sprinkle some pod masala and serve. Adjust the spice and chutneys according to your taste. Make mini idlis and fry. If you don’t get podi masala(I bought ready made), sprinkle some chat masala. If the yogurt is sour, add a bit of sugar to it. Click on the links to get recipe of the chutneys. I have to make this soon…and love the chaat served in the glass…lovely idea. Thanks Saswati, do try it am sure your family will love it. Thanks Waagmi.. making again this Friday for Nami's friends, come over. What an idea Mayuri Patel. Loved it. Drooling to see your yummy chaat picture. Never thought of making Idli chaat. Amazing share!! Thank you so much Priya, my family loves this chaat. podi masala is a mixture of urad dal, chana dal, red chilli and other spices that are blended to make a spicy dry powder very popularly used in South Indian cuisine. Its readily available in south indian stores. I love this fusion of North meets south..also the way you have presented this chatpatti fusion chaat in a the glass..after reading the post suddenly missing all the chaos and all that noise in India.. the chatpati life in India just like this chatpatti chaat. Thanks Swati and I know the feeling of missing India, all the noise all the food and hustle bustle. Whenever we are here, after a while yearn for peace and quiet and then when we go back to Kenya, miss India terribly. Idli Chaat sounds lip-smacking delicacies. I am drooling over that glass.what a fusion I would say, with all those chutneys, Dahi and Crunchy idli. Yum. Thank you so much Renu. Thanks Veena, its such a change to normal idli or stir fried ones. I loved it the first time I tasted it at a restaurant. Adding our own ingredients like pomegranate, tomato makes it more enjoyable.